Our wonderful community here at St. Matthew has continued to grow as we are blessed with new families, which is a source of joy for all of us. In an effort to meet the needs of our growing congregation, we provide many outreach programs and events, and increasingly there simply isn&apos;t enough space to accommodate everyone all of the time. 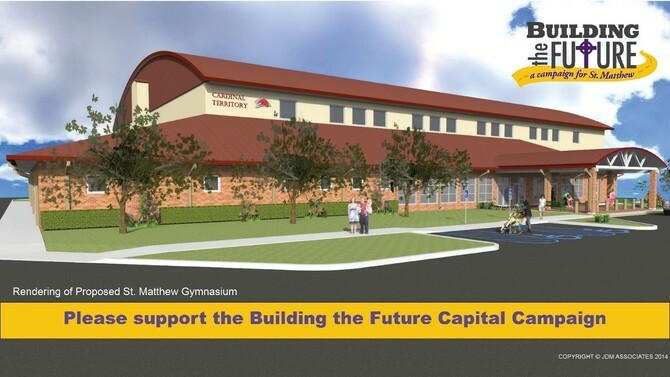 Last spring, we began a capital campaign called "Building the Future" which was organized in order to provide funds for the expansion of our campus and new facilities for Parish events. Our plan for "Building the Future" includes a new road that will provide a second entry to the campus from Vance Jackson, a gym complex for CYO sports, and a new community center. Every one of us here at St. Matthew will benefit from these much-needed developments.